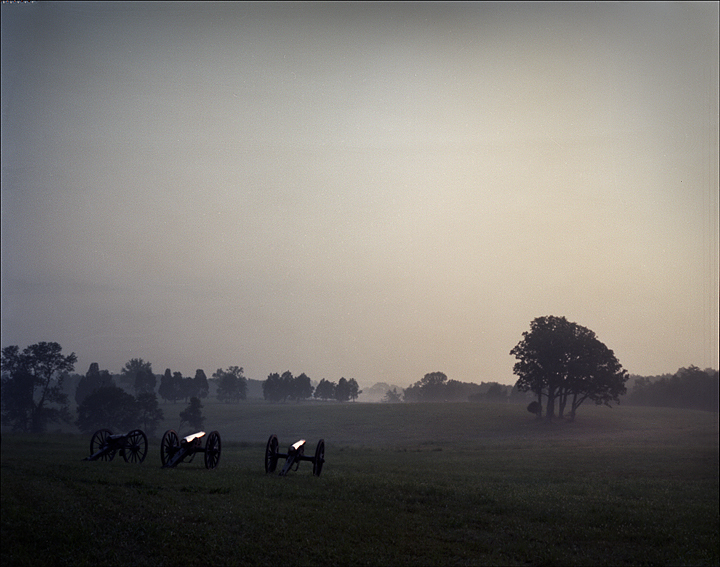 Rickett’s Guns sit atop Henry Hill during sunrise on the 150th anniversary of 1st Manassas. 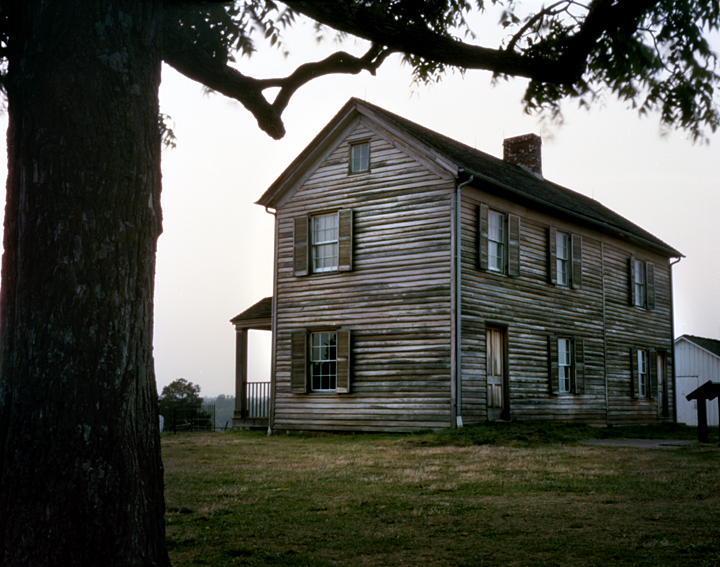 My first trip for the project brought me to Manassas, Virginia, 30 miles west of Washington DC. It was here that the opposing armies of the American Civil War first met on July 21st 1861. The battle called Bull Run by the Union, and 1st Manassas by the Confederates, would be the first big battle of the Civil War. Both armies believed that this would be the decisive battle of the war; a quick end to the question of secession rested on the outcome of this battle. Residents of Washington DC, came in their carriages with packed lunches to watch the battle from the sidelines. This first battle at Manassas is also where Brig. Gen. Thomas Jackson received his famous moniker. Confederate General Barnard Bee exclaimed to Jackson during the height of the fighting: “The enemy is driving us!” Jackson replied: “Then, Sir we will give them the bayonet!” Legend has Bee, encouraging his troops to stand, shouted: “There is Jackson standing like a stone wall, let us determine to die here, and we will conquer” …….and thus begins the legend of Stonewall Jackson and his Brigade ……. Aside from the Officers Corps, troops on both sides were unexperienced in warfare and confusion reigned throughout the fight . The battle surged back and forth eventually ending in victory for Confederate forces, sending the Union troops “skedaddling” back to Washington DC. The battle brought 4800 casualties to both sides and many were convinced the war would drag on into to the foreseeable future. Manassas at the time was a small town with rolling farms and an important rail link: Manassas Junction. Today much of the town has taken on the look of modern America with strip malls, fast food restaurants and the like, although, thanks to preservationists, the battlefield itself looks much as it did in 1861. The modern roads that run through the battlefield, the Warrenton Turnpike, now Rt 29, and Sudley Road, are the same roads that soldiers marched and fought on 150 years ago. Those roads, lined with cross rail fences, today deal with a different kind of congestion as rush hour can bring bumper to bumper traffic to the Battlefield at Manassas. Summer temperatures around Washington DC, can be brutal and this was the case in July of 1861, as well as July 2011. There are many recorded instances of soldiers dying of heat exhaustion that day in 1861. On my trip in 2011, temperatures reached above 100 degrees. Hiking around the battlefield with film and pinhole cameras was taxing and I came to empathize with these soldiers and what they went through that day. Walking these battlefields can be a humbling experience. After watching the sunrise on Henry Hill, the focal point of the battle, I made my way down to the Bull Run Creek to see where Union troops first crossed to join the battle on the morning of July 21st 1861. The creek looks as it did in the 19th century: slow moving, 30-40 feet across with somewhat steep banks. It presented a serious obstacle to the Union troops. Union engineers sought areas along the creek that could be forded, one of those, the Farm Ford, I photographed. 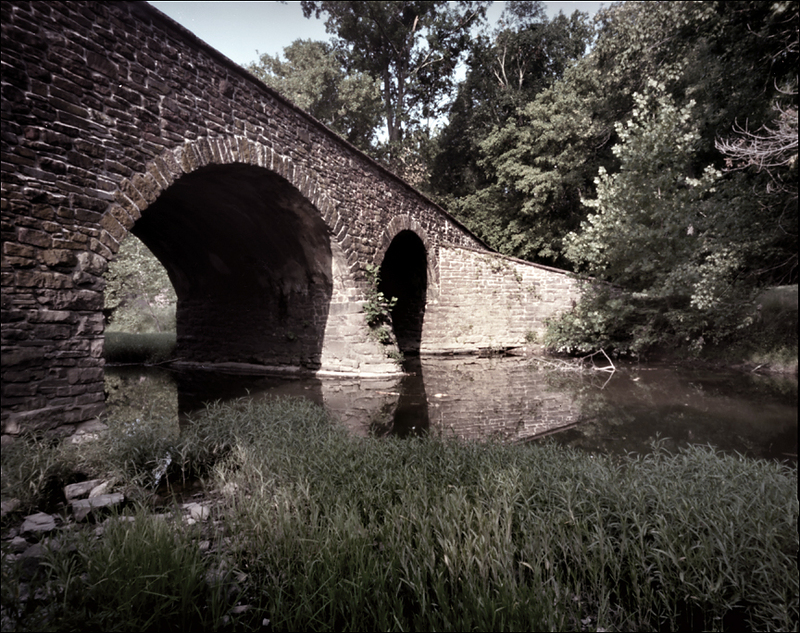 An old stone bridge crossed the creek near the Warrenton Turnpike, now Lee’s Highway, Rt 29, and still exists today. That bridge was the retreat route for many Union soldiers after that days fighting. 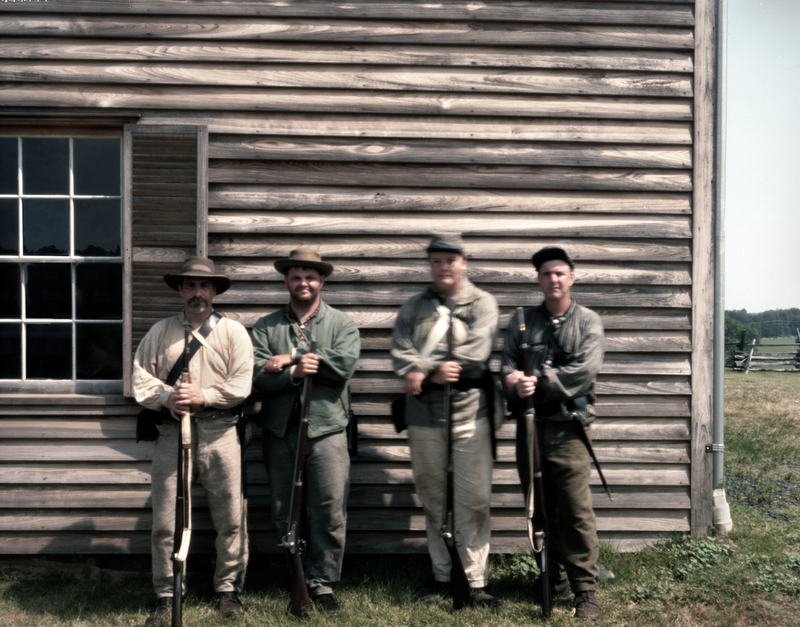 I moved on, following the course of the days battle, eventually ending up near the visitors center. It was there at the Henry Hill House where I met a group of living historians, re-enactors, speaking with visitors about the battle as part of a National Park Service program. Chatting with these gentlemen for a while I decided to take their picture. Returning home and looking over the images I had taken, it was that image of the re-enactors that took my project in another direction. My initial idea was to simply photograph the famous battlefields of the war with the pinhole camera. The battlefield images seemed to capture the quiet, haunting beauty inherent in these landscapes, but I found these images lacked a human element. After seeing how the pinhole camera rendered the re-enactors a bell went off in my head: I would now be adding battle reenactments to the project to coincide with the battlefield images. It was here at Manassas, on the 150th anniversary of this first major battle of the Civil War, that I realized my project in full. 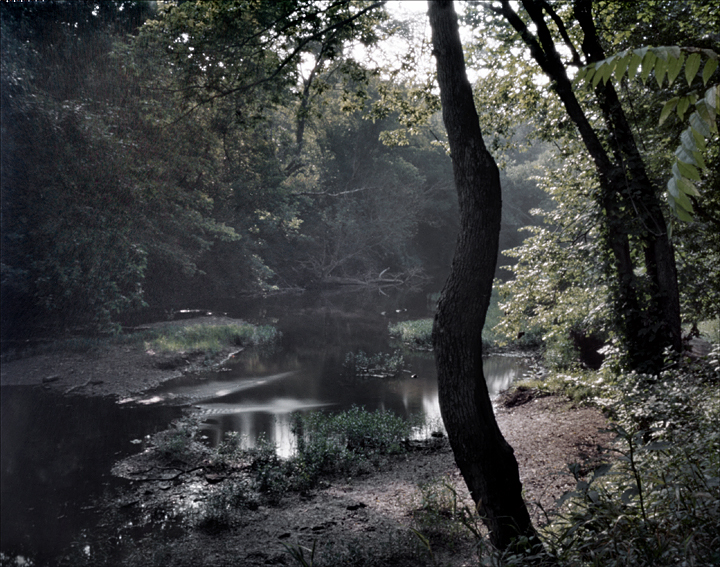 The next stop on the War’s timeline will take us to the banks of the Tennessee River at a place called Shiloh. love the pinhole renditions, I use a holga for film sometimes and that too is basic and guesswork, though not so extreme. The shot of the 4 soldiers is quite ethereal as if they are ghosts materialising. Thanks for checking out the Blog. Please check back as the blog will be continually updated through 2015…. I will do, look forward to learning all about the civil wars. I’m not sure hether this post is written by him as no one else know such detailed about my problem.